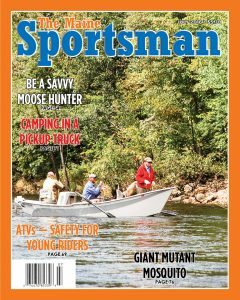 [dropcap]K[/dropcap]ing Montgomery’s photo on the cover of the July, 2016 issue of The Maine Sportsman features a drift boat heading down the Androscoggin River above Dixfield. Aboard is the famed Bernard “Lefty” Kreh, author of many fresh- and saltwater fly fishing books, and creator of the Lefty’s Deceiver streamer fly pattern. Other members of the drift boat crew include Bob Duport and Bonnie Holding. Like summer in Maine, a drift boat is designed for easy living, and living is indeed easy when such a vessel being piloted by a skilled guide. The force of the current transports the fishermen. The boat’s stern, which is oriented downriver and meets the whitewater first, is upturned and sharply pointed; the bow, which faces upriver, is flat; and the hull is rounded fore and aft like a rocking chair, permitting the oarsman to pivot deftly around rocks. It’s a great way to fly-fish for salmon, trout, and smallmouth bass. Inside the issue’s pages, readers are provided not only with how-to and where-to information about fish and game, and they are also informed about current events. For an example of the latter, in “Jon’s Jottings,” Jon Lund yields his space to allow the Maine’s Warden Service to respond to allegations of entrapment following an undercover investigation that resulted in convictions (upheld on appeal) for night hunting; hunting out of season; exceeding the limits on deer, moose, grouse and trout; and killing whitetail does without an antlerless permit. DIF&W does a lot more than just go after poachers, as Tom Seymour (“Midcoast Report”) explains. Seymour accompanied fisheries biologists as they electro-fished Megunticook Lake and its tributaries. In the process, the scientists learned that many streams and brooks, some mere trickles, held populations of brook trout. George Smith (“Capital Report”) summarizes outdoor issues addressed during the most recent legislative session in Augusta, including describing a new law that protects Maine’s shooting ranges from liability against nuisance lawsuits filed by residents who move into a neighborhood and then want to shut down nearby ranges. JP Falzone offers up a great “Saltwater Fishing” special section, featuring outstanding photos of happy anglers and hints for success provided by several charter boat captains. And in his regular saltwater column, Barry Gibson provides some good news for ocean fishermen, describing the new and relaxed rules permitting the recreational taking of limited numbers of cod, haddock, and tuna. Want to improve your fly fishing technique? Read Michael Jones’ “Use Less Effort” how-to guide. Jones has worked in Maine and in South America as a fly-fishing professional for more than 25 years, and he really knows his stuff. And what pattern works especially well in Maine? According to Lou Zambello (“Freshwater Fly Fishing”), one go-to offering is the Swanson’s stonefly nymph – and if you contact Lou directly, he’ll tell you how to tie it. Further into the July issue, Bill Graves (“The County”) checks in with another of his always informational and entertaining pieces, this one focusing on dry fly fishing success around dusk on July’s warm evenings. 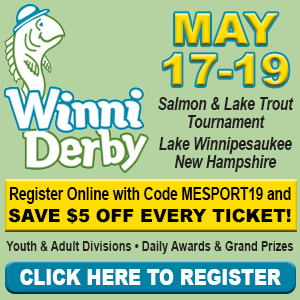 And trout are not the only angling targets this month – William Clunie (“Western Maine Mountains”) goes popper fishing for smallmouth bass in the Androscoggin, while Tom Roth (“Sebago to Auburn Region”) searches out lunker togue in Sebago Lake and environs. For those hunters lucky enough to be drawn for a moose permit (or fortunate enough to have a close friend or relative who named then as a sub-permittee), Steve Vose describes the importance of pre-hunt scouting and details his success in last year’s hunt. Motorized sports also get their due, as Shane Brown of ATV Maine reveals the secrets of safely teaching kids how to ride all-terrain vehicles, while William Clunie’s “Off-Road Traveler” describes how to cushion the hard bed of a pick-up truck to transform it into a comfortable sleeping area, so early-risers can get the first trout at sun-up. 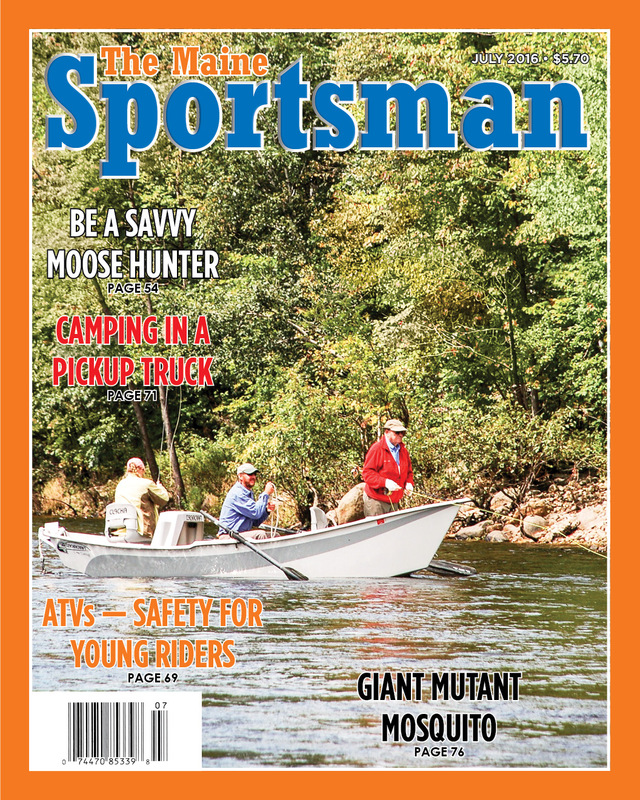 Finally, our “Young Maine Sportsman” writer, Luke Giampetruzzi, tells the terrifying tale of “Big Buzz,” the mutant mosquito that arose from an oil slick under an engine block to harass the kind folks at Frank Carr’s camp, until the camp’s residents hatched a foolproof plan to eliminate the giant insect. All this and more, including jokes galore, readers’ letters, features, the Almanac, and regional and subject-matter columns and articles to help you enjoy all that a Maine summer has to offer. 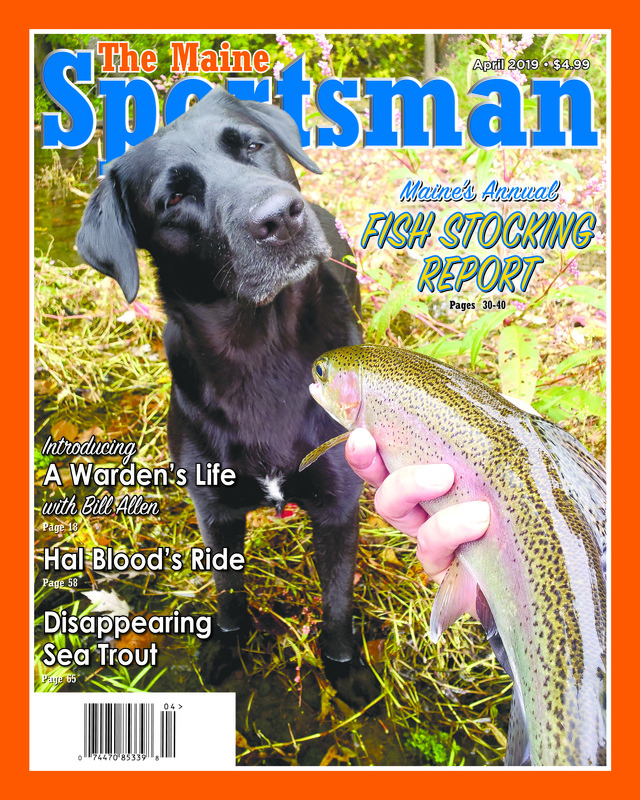 Be well, get outside and enjoy – and bring along your copy of The Maine Sportsman magazine.